One could spend a lifetime learning the art of making tea. Tea sage, Yu Lu, wrote a book about the intricacies of making a perfect cup called the Cha Ching or the Classic of Tea, and dedicated 24 implements for the making of tea. Yet tea embodies the spirit of simplicity; all that is needed to make a beautiful cup is premium quality tea leaves, a peaceful mind and pure spring water heated to proper temperature. Teaware is not only a matter of aesthetics, but is considered an important element in tea preparation. In the Gongfu style of tea preparation, a clay or porcelain tea pot or gaiwan is used for the ultimate contemplation of the many layers and nuance premium teas are known for. temperature and amount of leaves for your ultimate enjoyment. let sit for 3-5 seconds, then pour the tea water off. This serves to clean and loosen the tea as well. Weigh 5-7 grams of tea - about a quarter size - for a small pot or gaiwan. Bring water to appropriate temperature. Flash rinse tea (see above). Wait one minute for leaves to open up; enjoy aroma. Pour boiling water over tea leaves and let steep for 7-10 seconds; strain and serve. For successive brews, increase steeping times according to taste, adding time gradually. 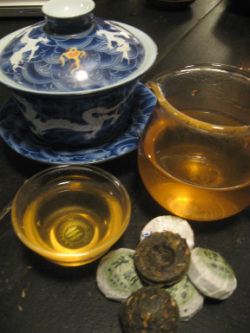 White, green and oolong teas can be brewed up to 5-8 times; puerh 8-20 times.